-The Hot Tub High Dive board game includes a demo bottle of bubble solution -This fun game for fami.. Blast into overdrive with Nerf Nitro sets! Kids can create awesome stunts as they fire foam cars fro..
-The Thunderhawk bolt-action blaster is the longest Nerf blaster, extending to 41 inches (1 meter) t..
-Counts darts as battlers fire their blaster -Measures dart velocity in feet or meters -Part of th..
Customize this blaster to defeat the competition! .. The Game of Life game is full of surprises Experience Life's Key Moments Vacation Cards Inc.. The Pie Face Cannon kids' board game is a real blast! Get ready for loads of laughs and share hil..
Blindfolded, poop-dodging fun Mold the included compound to look like piles of poop Step in t..
Play-Doh play lets kids take the lid off their imaginations and explore their creativity Can pa..
-Blast into double-stunt action with the Nerf Nitro doubleclutch inferno toy set that has a blaster ..
Trail/All-Mountain clipless pedal, Shimano SPD compatible, alloy CNC body, sealed bearings & DU ..
15-dart rotating drum Fires darts up to 90 feet (27 meters) Slam-fire darts fast Pump-action blas..
Stay in stealth mode or light the way with the Nerf Modulus Ghost Ops Evader blaster! This motorized..
-Car-blasting action -Create outrageous stunts -Foam car designed for speed and distance -Include.. The explosive Transformers saga continues with Transformers: The Last Knight. With the fate of Earth..
-Includes 3 foam body cars -Designed for speed and distance -For use with Nerf Nitro blasters (eac.. 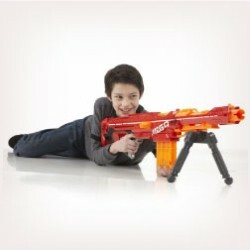 Boys can build their own blaster for each mission or battle with the Nerf Modulus IonFire blaster fr..
Pump-action, clip-fed blaster Slam-fire blasting Part of the Mediator Series Barrel and sto.. Break into Nerf Mega battling with the Tri-Break blaster that features a break-open, 3-dart barrel. .. The Nerf N-Strike Elite RaptorStrike blaster is part of the AccuStrike Series, which features darts .. Blast darts designed for accuracy! Part of the Accustrike Series, this refill pack includes 24 Elite..
-Blast 2 darts at once -3 ways to blast – 1 dart, 2 darts, and slam-fire -Holds 10 Nerf MEGA darts.. The Nerf N-Strike Elite Dual-Strike Blaster blasts the competition with double the impact! The Nerf ..
-This version comes in simple brown packaging -Breech-load, double-barrel blasting -Fires 1 dart a..
About Product Children can challenge their friends to a battle with the Nerf N-Strike AlphaHa..
About Product Children can build their own blaster for each mission with the Nerf Modulus Tri..
About Product The built-in clip allows high rate of fire, because it will automatically advance to ..
About Product Take aim with the HyperFire blaster and challenge opponents with ultimate speed.. The Recon MKII is a fully customisable 4 in 1 blaster. This blaster comes with a 6 dart clip, 6 Elit..
About Product Get ready to build and customise the ultimate Nerf blaster with the motorised N..
About Product Your battles are about to get a whole lot bigger - Mega bigger. The Magnus blas..
N-Strike Warriors Lose When They Run Out Of Ammo, And There?S No Better Way To Load Up On Firepower ..
About Product Dominate any battlefield with the double-barrel assault of the Rhino-Fire blast..
-High quality toys for children all ages -Made using safe materials -Tested for quality and durabi..
Load up big-time for any N-STRIKE ELITE mission with the Tactical Vest Kit. The kit's Tactical Vest,.. Experience the excitement, energy, and attitude of the Nerf brand, and find out why It's Nerf or Not.. The launcher places spin on the foam ring which maintains its li' and keeps on go'in Super accu..
Drench your opponent in water and win! Hydro 3 from Zuru is 3 times the fun with its 3 in 1 fu.. Prepare to Zip! Introducing the all new Zip Stix Stunt pack, which has everything you need to get zi.. Product Description Prepare to Zip! Introducing the all new Zip Stix Stunt pack, which has everythi..